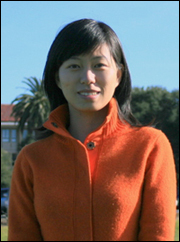 Alumna Enlu Zhou (ECE Ph.D. 2009) has won a 2012 Young Investigator award from the Air Force Office of Scientific Research (AFOSR). She will be investigating “Dynamic Decision Making under Uncertainty and Partial Information.” She is one of 48 young faculty members nationwide to receive the award this year. Zhou is currently an assistant professor in the Industrial & Enterprise Systems Engineering Department at the University of Illinois Urbana-Champaign. She has research interests in stochastic control, Markov decision processes, simulation optimization. At Maryland she was advised by Professor Steve Marcus (ECE/ISR) and Professor Michael Fu (BGMT/ISR) and was part of the A. James Clark School of Engineering’s Future Faculty Program. The objective of the AFOSR Young Investigator Program is to foster creative basic research in science and engineering, enhance early career development of outstanding young investigators, and increase opportunities for the young investigators to recognize the Air Force mission and the related challenges in science and engineering.